Director general of Durian Energy Inc. said the private German firm plans to maintain its presence in Iran despite new US sanctions against Tehran as it is working on a major solar farm project in the country. "Despite the sanctions, we have no intention to leave Iran and we will stay in Iran," Uwe Jorg Kuhnle said, Tasnim news agency reported. He added that Durian has invested $27 million in the sector of renewable energy to build a 20-MW solar farm in Iran and for this reason they will not halt their work in the Islamic Republic. "We are opposed to any unilateral and personal decision," the senior official stressed, apparently referring to US President Donald Trump’s decision to withdraw from the 2015 nuclear deal between Tehran and world powers and impose new sanctions. "The US sanctions have created a confusing situation for foreign investors, particularly in the sector of renewable energies," Kuhnle said. 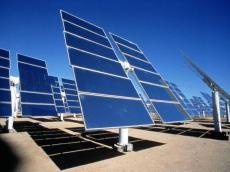 "We have currently a 100-MW solar farm project underway in the country," he further said. Iran is one of the most energy-intensive countries in the world, where inefficient energy use amid consumer subsidies has resulted in a per capita energy consumption that is 10 times greater than that in the European Union. According to the Renewable Energy Organization of Iran, there are only 15 wind farms in Iran, where 100,000 megawatts of potential capacity from wind alone exists. On May 8, the US president pulled his country out of the Joint Comprehensive Plan of Action (JCPOA), a nuclear agreement achieved in Vienna in 2015 after two years of negotiations among Iran and the Group 5+1 (Russia, China, the US, Britain, France and Germany). After Donald Trump withdrew the US from the deal, his administration moved to re-implement the previous sanctions against Iran. The United States reimposed stiff economic sanctions on Iran on Monday, ratcheting up pressure on the Islamic Republic despite statements of deep dismay from European allies. A first set of reimposed US sanctions affect financial transactions that involve US dollars, Iran's automotive sector, the purchase of commercial planes and metals, including gold. A second batch of US sanctions targeting Iran's oil sector and central bank are to be reimposed in early November.